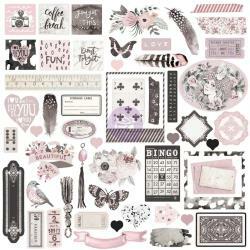 This package contains an assortment of sixty (60) Ephemera Die Cuts. Some are embellished with Foil and all are sure to accent & embellish any of your Craft Projects. Part of the Rose Quartz Collection by Prima Marketing Inc. Look for coordinating Designer Papers, Journaling Cards, Puffy Stickers, Flowers and more.